My daughter’s friend studied at globalart and she showed great development and noticeably better in art and social skills, so I decided to enroll my daughter with globalart and it has been a good 3 years! Nutnapin is happy to study at globalart where I don’t even have to remind her on her weekly lesson. Her best improvement since joining globalart is her concentration, she can now concentrates on her work much better and I can also see her confidence through her art skills, creativity and imagination in many of her artworks! 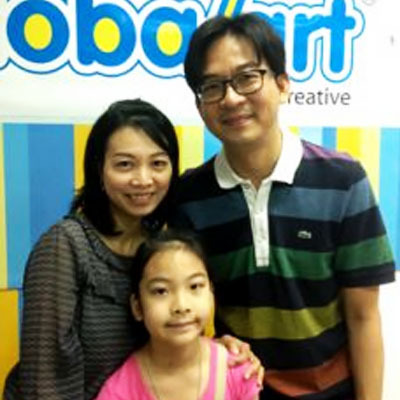 I think globalart’s step by step programme is very effective in making it fun and easy to learn and progress. I believe art is important in developing my child’sIQ & EQ and will let her think about her future in a more reasonable and realistic way. We would also like to thank globalart teachers for your care and attentions by saying we love you!